Revolabs introduces the Revolabs FLX VoIP, the first wireless conference phone designed for VoIP networks. Supporting a wide variety of IP switches, the FLX VoIP is the only conference phone that supports the audio clarity of HD audio while providing the freedom of wireless microphones and speakers. The feature set that has been available through the Revolabs FLX for analog phone lines is now also available for IP telephone networks, providing unprecedented conference call clarity and flexibility. The FLX VoIP integrates directly with most IP telephone switches following the SIP standard. Through this integration, new features only available through digital switch environments, such as voice mail alerts and "do not disturb," can now be offered with the FLX VoIP. The phone's wireless capabilities allow it to be used in small and midsize conference rooms without running any cables. As with the FLX for analog phone lines, this allows for a clean look while requiring less space on the conference table. The independent microphones, speaker, and dialer of the FLX VoIP give the user freedom and flexibility that other conference phone systems cannot offer. Voxbone announces it is providing geographical and toll-free numbers to help cloud communications provider 8x8 expand its international calling capabilities to serve larger business customers on a global scale. The new relationship with Voxbone enables 8x8 to provide geographical and toll-free numbers for business customers with offices outside of the United States. Additionally, Voxbone services are making it easy for 8x8 to swiftly and fully integrate its recently acquired hosted contact center capabilities with its established telecommunications services. 8x8 is using VoxDID, which provides geographical numbers to extend the international reach of its network quickly at minimal costs, as well as Vox800, which provides local toll-free phone numbers for various countries for direct inward dialing. Atlantic Tele-Network has selected the DIGITALK SBC VoIP Peering Platform to consolidate national and international call routing across its subsidiaries. Atlantic Tele-Network has chosen to streamline the operations and management of routing and rating, with the DIGITALK VoIP Peering Session Border Controller sitting at the network core. The DIGITALK Carrier Platform will support US jurisdictional routing including local, intra and interstate routing, with local number portability look-up. Voxbone announces that despite economic uncertainties in some parts of the world last year, its pattern of steady year-after-year growth in VoIP communications continued as demand from existing customers increased, coupled with new business wins from some of the fastest-rising operators in telecommunications. The company is calling 2011 a breakthrough year because it enjoyed lift for the first time from customers such as Telefónica and iBasis, while most growth came from direct sales to its customers among providers of next-generation VoIP communications services. Overall, Voxbone said, revenue grew 19 percent, while minutes of use on its global network increased by 33 percent to 2.8 billion. 98 percent are likely or very likely to recommend VoIP Supply to colleagues or other businesses. 97 percent are likely or very likely to purchase from VoIP Supply again. 87 percent report an exceptional or above average experience with VoIP Supply. Half of the customers consider VoIP Supply literally the best in the industry. netTALK.com announced new pricing on its netTALK DUO in Canada. Across Canada, the retail price of the current netTALK DUO changes from $79.95 to $59.95 (which includes one year of service), delivering the best value in low cost communications. In addition to the lowest price on the most innovative VoIP device on the market, netTALK's calling plans are the most competitive and comprehensive, offering calling solutions that connect friends and family worldwide for a low annual price. netTALK also provides unrivaled live, trilingual technical support, seven days a week, devoted to ensuring customer satisfaction. This development follows the addition of the affordable Enhanced Call Plans, netTALK’s flat-rate International Call Plans. The new North America Add-On is $70 (plus taxes) per year for calls to the U.S., Canada, with the addition of Mexico and Puerto Rico. The International Add-On is an unprecedented $120 (plus taxes) per year for calls to 60 additional countries. It is an offering unmatched by netTALK's competitors, such as Vonage, Skype, magicJack, or traditional phone companies. Acrobits released its new combined Voice and Video application with SmoothFlow video technology for Apple’s iPhone. The Voice and Video applications are available in two versions; one for the consumer market (SIP Phone) and one in a fully featured business phone application (Groundwire) with both apps loaded with features such as HD Sound, Phone book integration and Avatar Dialing. Consumers can choose from hundreds of pre-configured VoIP carriers across the world while the Groundwire business application works with both closed and open source office IP-PBX platforms such as Cisco, Avaya and Asterisk. XConnect has entered an exclusive partnership agreement with DE-CIX to establish the first Next Generation Network/VoIP federation in Germany, enabling service providers to directly exchange IP voice and multimedia traffic. The partnership will create a secure and scalable federation hub and central carrier ENUM-based routing and number-management platform that will enable hundreds of fixed, mobile, ASP and Web 2.0 operators to interconnect securely end to end on an all-IP basis. Interconnection via the hub will benefit operators significantly. It will reduce the technical complexity and commercial and operational costs of NGN interconnection, allowing for migration from bilateral, legacy-network TDM interconnects to IP. In addition, operators will be able to securely and multilaterally interconnect to multiple networks via a single IP connection to the hub, supporting the interworking and interoperability of IP voice and multimedia services, such as HD voice, video and Unified Communications. VoIP Supply is happy to announce that they've added the new Sangoma Vega Gateways that will increase connectivity options for your VoIP application. Sangoma is "not just a board company anymore." Realizing the popularity of gateway appliances and the need for different but equal solutions for varied VoIP application scenarios, the Sangoma Vega Gateway line was launched to provide greater flexibility for VoIP integrators. Ooma announced at the 2012 International CES in Las Vegas, Nevada, a new cordless handset with superior HD Voice call clarity and smartphone features made possible by the Ooma cloud-enabled platform. The new cordless Ooma HD2 Handset features a two-inch color screen and picture caller-ID with the ability to automatically display Facebook profile pictures and online contact lists from Facebook, Google and Yahoo. Picture caller-ID and contact lists provide the ability to see a picture of the caller as the phone rings, download and scroll through contacts, and easily manage contacts using the My Ooma web portal. The combination of the Ooma Telo and new Ooma HD2 Handset provides cutting-edge HD Voice call clarity by capturing twice the voice data to double the fidelity of standard phone calls, for richer, more natural-sounding conversations. The cordless handset offers superior security and range afforded by the latest DECT technology without interfering with home Wi-Fi networks or other home electronics. 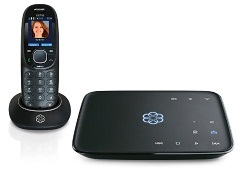 Up to four handsets can be used with each Ooma Telo. Digium and Polycom announce the continuation of their strategic partnership. Throughout the world, Polycom IP phones (such as Polycom SoundStation IP conference phones and Polycom VVX business media phones) are commonly deployed with telephony systems based on Asterisk, Digium’s popular open source communications software. Digium and Polycom’s partnership will ensure that customers and partners will continue to benefit from tightly integrated, standards-based solutions on Polycom phones with simplified provisioning and broad support for Asterisk features. The agreement allows developers to continue to create applications for Digium and Polycom solutions, including management features, such as provisioning and other specific vertical market features. Additionally, Digium and Polycom will continue to jointly conduct tests to ensure smooth interoperability between Digium-branded solutions, including Switchvox, Asterisk open source software, and Polycom phone solutions. In the future, video solutions such as Polycom RealPresence video will also be added to the offering and tested for interoperability. As the provider of the global standard in SIP training and certification, The SIP School has taught thousands of employees in the telecommunications industry how to better support their clients, products, and services. Until recently, students training to become an SIP School Certified Associate were instructed in their first session to create a SIP address with any free service. Today, The SIP School announces another option by working with OnSIP as their SIP service provider – leveraging the OnSIP API to provision each student with a SIP address on thesipschool.com domain.